A great all-around lens with VR II and remarkably wide coverage. The most balanced and versatile standard zoom lens for passionate DX-format D-SLR shooters, the AF-S NIKKOR 16–85mm f/3.5-5.6G ED VR offers a 5.3x zoom range. Incredible sharpness, a compact body and Nikon VR II (Vibration Reduction) image stabilization ensure steadier stills and HD videos and more shooting opportunities—from everyday portraits to travel, landscape and architecture. The highly versatile AF-S DX NIKKOR 16-85mm f/3.5-5.6G ED VR delivers incredible optical performance in any setting. Its compact 5.3x wide-angle to medium telephoto zoom is ideal for a broad range of still and HD video shooting situations, from interiors and portraits to breathtaking landscapes. Focus as close as 1.3-feet from your subject throughout the entire zoom range, and discover how far your creativity will take you. Nikon VR (Vibration Reduction) image stabilization provides 3.5 stops* of blur free handheld shooting, assuring dramatically sharper still images and HD video capture. Two Extra-low Dispersion (ED) glass elements offer superior sharpness and color correction by effectively minimizing chromatic aberration. 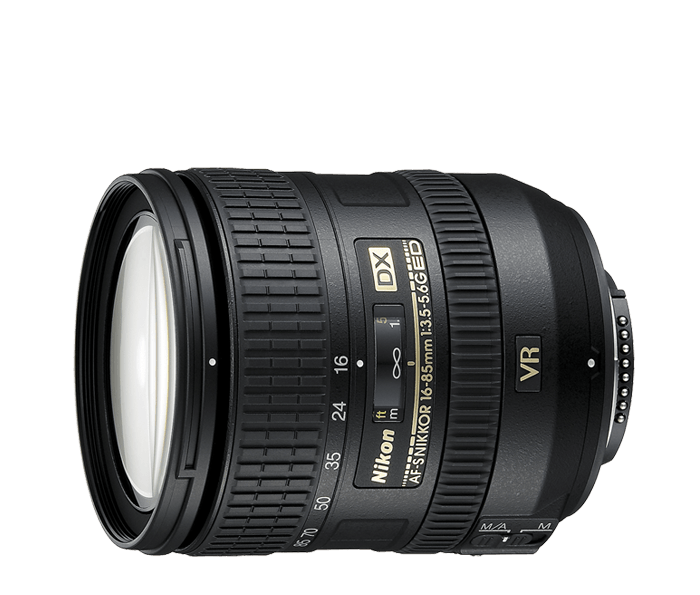 And the AF-S DX NIKKOR 16–85mm f/3.5-5.6G ED VR’s three Aspherical Lens Elements (AS) virtually eliminate coma and other types of lens distortion.